This book interweaves the concepts of the guidance on globalization, international management, and the intricacies of international business that many books on the market treat independently. It clarifies and explains culture, cultural misunderstandings, and cross-cultural interactions. 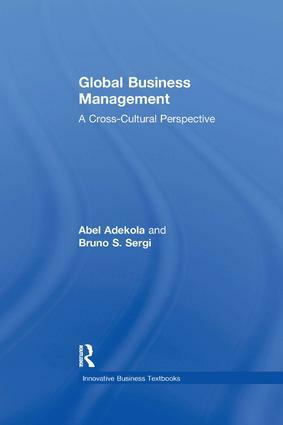 Adekola and Sergi's text is unique in that it offers both the management perspective and the cultural perspective. It is for managers seeking to thrive in the global economy. This book focuses on managing global organizations, providing a basis for understanding the influence of culture on international management, and the key roles that international managers play. It clearly shows how to develop the cross-cultural expertise essential to succeed in a world of rapid and profound economic, political and cultural changes. Prof. Abel Adekola is a tenured Professor and Chair of Business Administration Department of the College of Technology, Engineering and Management at the University of Wisconsin, Stout. He is also an Adjunct Professor of Strategic Management and Business Policy at the University of Minnesota's Carlson School of Management. He has served as visiting Professor at numerous international Universities including ISM University of Management and Economics, Vilnius Lithuania, Rai University in India and the University of Malaya in Kuala Lumpur, Malaysia. He has presented a wide variety of seminars and workshops to representatives of corporations, government agencies, and academic institutions in the United States, Latin America, Europe, and Asia. He has published several academic papers in his discipline. Bruno S. Sergi is currently at the University of Messina and Greenwich University Business School. An expert on international business and transition economies in East-Central Europe, Russia, and China, he has taught and guest lectured in several European countries and the United States and published numerous articles and books for college students and professionals. He works with several scientific journals as either an editor or a member of the editorial board. The purpose of this series is to provide business textbooks for specialist, option or advanced courses. Published in hardback at paperback prices and written by acknowledged experts, Innovative Business Textbooks are comprehensive and reliable. Each includes a range of learning aids to assist both lecturer and student.